A better and safer Brazilian straightener was developed in Brazil to replace the Keratin Treatment and it is finally arriving in the US. The product does not contain the ingredient that causes the problem: formaldehyde. I learned about it when visiting a friend who has been using the "Marroquino" treatment for a long time without problems. The hair salon that she goes to stopped using the Keratin once the new product became available in Brazil. Another advantage of the Marroquino is that you can wash your hair immediately after you complete the treatment. It does not require use of masks. It is the real thing! 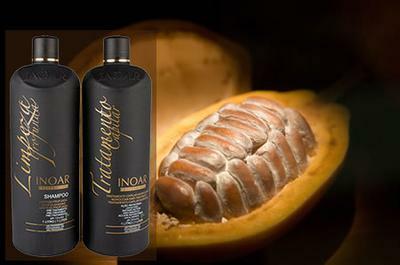 The salon told me they import the product directly from Brazil until Inoar's distributor in the US brings the first shipment by the end of July. The Keratin treatment sold in the US is made in the US. The Marroquino product is actually made in Brazil. I tried it on my hair and so far it is holding strong. I'm sold to the Marroquino now! Anyone doing this in NYC? Is there anyone here that does this treatment in NYC? I would like to try it out if anyone here works for a salon that does this treatment. My sis` tried this product for the first time in SA and was really satisfied.her hair look really healthy and shining and don't need to brush it with a hairdirer every-time you wash it. I'm going to try it myself.thanks INOAR. We live in MN, USA with climate doing havoc on hair, and visited SA during Dec. 2010. Our daughter treated her mother to this Brazilian in Pretoria. The stylist used Inoar G-Hair and today, 4 months later the hair is still unbelievable and easy to manage. Her USA stylist just cannot believe and they will be doing a next run during May on my wife. My facts are correct as this product was sold in Canada under the claim of 0.2% when in fact it was almost 3%. It has been recently pulled off the shelves by the government who actually did their own tests and deemed it potentially unsafe. There are two types of tests, one in the liquid format where formaldehyde doesn't exist and the other in a gaseous form where the fumes contain almost 3% formaldehyde. This product does contain formaldehyde, in fact 2.84% as tested by two independent labs. Our salon has been using the INOAR keratine treatment for over a year and NONE of our clients came back to have it redone because the results were minimal at best!! The representative who sells it here in Montreal replaced our bottles because we were told that our last lot was defective and she redid one of our clients for free (at our UTTER insistence) and it STILL did not work!!! It was not because of the application FOR SURE especially since the trainer came and did it. NOW we have received a letter from her saying that Canada had NOT approved it and they are unable to sell it anymore and all our stock has to be thrown away!! That is over $1000 worth of product that the company will NOT refund, even full bottles, and Canada Health is saying there can be serious side effects from the product. Thank goodness none of us or our clients have seen bad side effects....yet...but dont start into this product unless you want unhappy clients and a ton of stock that has to go down the sink. If anyone knows how we can get a hold of the main distributor so we can figure out what actions to take from here, that would be great!!! Agnes, I use it here in Washington! I've had great results in my salon with INOAR Moroccan. You have to do the treatment the correct way though. Most hairdressers are probably using too much product and then not flat ironing the hair enough times. When you use the appropriate amount of product to the type and length of hair and there will be little if any fumes. Also, when flat ironing the hair, take the time to do it in small sections and go over the hair about 15 times for each section with a GOOD flat iron that will maintain the appropriate heat. My clients treatments last 3-4 months after perfecting these techniques. Their customer service really helped me learn these tips and tricks about how to get the best results. I won't ever use one of the other brands again. Seriously, if you are curious get their number from their website and call them. You actually will be able to talk with someone who knows what they are talking about. I have tried a new product and I found it amazing, it is called Amino. It is made in USA, and it is formaldehyde free. The company is called Unnique (www.unnique.com). It is worth trying, really nice product. I used to buy this from "Marroquino" treatment Inoar, it was a good product, until the last 2 bottles that I bought, they just did not work, something changed in this product. But this is not what made me so upset. I called a company in Miami and they said "yes, some treatments came out defective, and we will be happy to send you another one if you bought from us". I said "but you are Inoar, you should guarantee your own product" and they answered "well, we are not actually Inoar, we were Inoar distributors, we are not distributors anymore, we are just liquidating our inventory; you have to go the headquarter's wesbite and talk to them, or ask your sales person to change it for you". I have been doing the Brazilian blowout for over a year now and really do love it! But the recent bad press and every time I go on line I get more skeptical. When I call the company they seem so reassuring but everyone else seems to differ. I'm thinking of looking into an alternative. I live in Seattle and don't know anyone that does the Inoar, so I would love to be the first! But, I can't find any reviews on it. The comments on this page have been somewhat good but I'm still skeptical. Anyone in my surrounding area or a state near by that is happy with Inoar? I am Brazilian and I know and love this product. You can trust 100%. In-fact I found this post trying to see if there was a place in my city Indianapolis where they are using this product. I move from Brazil 2 months ago, I did this Marroquino treatment for more then a year in Brazil. The other keratin blowouts are bad for hair and we don't use them in Brazil for years! I came here and I was amazed that you guys were doing the keratin one, don't do it, it brakes the hair with the time..
Well I hope Marroquino blowout be more popular here in US so I can do it here also. Any comments against Inoar are probably from somebody selling another brand! The INOAR Keratin is the original and the other brands are a copy from this product. I have used different brands before and when I found Inoar I was so happy because the results are the best. Try it yourself, the results speak for themselves. I did it about 6 months ago and my hair was still frizzy and not straight. For the first month it was more manageable to blowdry and it took a little less time but this produce didn't much to my hair. I used the shampoo and conditioner recommended but no luck. Maybe this product does not work well on all hair types. My hair is wavy with blonde highlights. It is damaged from the highlights and straightening iron. I did it again using another brand and i couldn't be happier. Did anyone had side effect after using this treatment because am hearing all the stories online and nothing happened to me or my clients in real life, and I never seen my client hair so good before I used the Inoar Marrquino treatment and they coming back. I know that Inoar have 0.2 formaldehyde but that nothing compare to all the daily product we use and the damage we get from the atmosphere and any one we having that treatment in our hair we are not eating or having bath with it. Maybe you're not seeing the results because the way you're using the product. Several of my stylists friends are using this product and they tell me they love it! Probably you don't know to do the right way! The best stylists are using this product and they are very satisfied about the results. The secret of this product is to use small amount. The application is simple but you have to make sure you don't over saturated the hair! I learned with some Brazilians hairdresser and they told me, that it's not the quantity of the product use one simple application but the way you do. I'm hairdresser for 25 years and I use this product for 10 years and I'm pretty sure this product is very good! Nobody had commented about the fumes that this product has.I had done a couple and the fumes are really strong the rests were grated but the fumes for me and my client were very strong. Does anybody know if this treatment is available in or around Cape Town, South Africa?